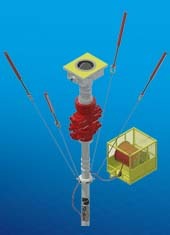 Top tension risers (TTR) provide surface access to subsea wells. They consist of sections of riser joints supported at the vessel by individual tensioner systems and connected to the subsea wellhead via an external tieback connector. The Oil States top tension riser system was developed for drilling risers and production risers with dry trees. It includes standard riser joints and specialty joints. The riser joints, stress joint and tension joint all incorporate Oil States’ Merlin® connections, providing high-pressure, metal-to-metal sealing, load capacities exceeding those of the pipe and excellent fatigue properties. Incorporates Oil States Merlin connector.